Auguste-Joseph Franchomme (1808-1884), in his time, was a renowned cellist, a composer and, for nearly forty years, a much loved teacher at the Paris Conservatoire. He published dozens of works for his instrument in addition to transcriptions and arrangements of works by Beethoven, Bellini, Donizetti, Chopin, Liszt, Mozart, Rossini and others. His performance style showed total mastery of technique especially in "the dangerous keys," according to Berlioz. Franchomme preferred classical restraint and beauty to a flamboyant manner. Franchomme was a close friend and collaborator of Chopin. Those interested in their collaboration will want to acquire also "Chopin's Complete [i.e., previously known] Works for Cello and Piano", performed by Viviana Sofronitsky and Sergei Istomin (Passacaille 968), which includes Chopin's Sonata, Op. 65 and Grand Duo for Cello and Piano on the Themes of Robert le Diable." The only overlap with the present recording is the Chopin Op. 3." 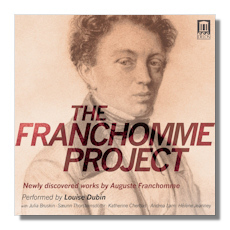 Louise Dubin's research is responsible for discovering long-unavailable works by Franchomme and for the present recorded selection. Franchomme's works are quite appealing to me. All are melodic, often lilting. Two of the Nocturnes are gentle and pensive, the Op. 15: 3 & 4 are stronger and faster. Caprice Op. 7:1 shows Franchomme's familiarity with Bach's Cello Suites, I think. Op. 7:9 has a much more varied tempo as played here. The piece based on Norma is beautiful, as one would expect. Dubin's performances of these pieces – both by Franchomme and by Chopin – are generally excellent. The Franchomme's pieces are performed here in an appealingly warm manner; I find luscious. This also the case with most of the Chopin pieces. The Chopin Ballade and Prelude, each arranged for four cellos, are both slow and lovely, with rich sound. The nine-minute Polonaise brillante is recognizably Chopin's in spite of the cello arrangement by Franchomme. I am not entirely happy with the Mazurka, but my only strong reservations about this selection are in respect to the Chopin Funeral March, which was transcribed by Dubin. I consider the Funeral March transcription a mistake, as it completely changes the character of the music. The history of this dead march includes public funeral processions for great and distinguished public figures, accompanied by transcriptions for band dominated by heavy brass. Much of it is a ponderous tread. This cello quartet makes the middle section especially sound like a gentle elegy for a private ceremony rather than a wrenching lament. A solo piano can produce the latter effect, as was brought fully home to me in an arrestingly intense and profound performance in Paris' Salle Pleyel a couple of years ago by the pianist Khatia Buniatishvili – which aroused in me memories of people I have personally lost. An available example of a public procession to this piece was presented by Ingmar Bergman in his film Fanny and Alexander, the occasion being the funeral of the father of the very young Alexander, who expressed himself audibly by repeating all the bad words he knew. Except for this personal reservation, I can enthusiastically and strongly recommend this CD.